A gloriously flavorful Avocado Toast Salad with slivers of fennel, fresh blood orange, and a zippy lemon dill vinaigrette, whips up in minutes with the help of the OXO Salad Spinner, and is a surefire hit for any season! With a simple avocado toast recipe, this salad is tossed together before being lightly dressed, ready to be enjoyed for a simple lunch, or alongside dinner! Preheat oven to 350 degrees. Add the baguette slices on a cookie sheet and brush with the California Olive Ranch extra virgin olive oil. Sprinkle with salt and pepper and bake until golden and crisp, around 5-7 minutes. Let cool for a minute, then top with sliced avocado. Cut avocado toasts into small bites. Add the fresh greens to the OXO Salad Spinner and wash thoroughly. Turn the cleaned greens out into a large bowl, then add the fennel, cucumber, blood orange and avocado toast bites. 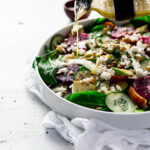 Top with the feta, sunflower seeds, and walnuts. In the OXO Salad Dressing Shaker, add all the dressing ingredients. Shake vigorously to combine, then drizzle over the salad. Divide the salad between four plates and enjoy!